Dogoran, the Mad Flame Kaiju and Gameciel, the Sea Turtle Kaiju appear in this card's artwork. "Destroy as many monsters on the field as possible" and "then Special Summon in Attack Position, 2 "Kaiju" monsters with different names from your Deck (1 on each side), but they cannot change their battle positions, and must attack, if able." are not considered to happen at the same time. If there are no monsters on the field, "Interrupted Kaiju Slumber" cannot be activated. If you only have 1 or less "Kaiju" monsters with different names in your Deck, "Interrupted Kaiju Slumber" cannot be activated. Since "Super Anti-Kaiju War Machine Mecha-Dogoran" is a Special Summon Monster, it must be Special Summoned from your hand using the procedure written in its text. Therefore, it cannot be Special Summoned from the Deck by the effect of "Interrupted Kaiju Slumber". Also, if you only have 2 "Kaiju" monsters with different names in your Deck, including "Super Anti-Kaiju War Machine Mecha-Dogoran", since the resolution of "Special Summon in Attack Position, 2 "Kaiju" monsters with different names from your Deck (1 on each side)" cannot be applied, "Interrupted Kaiju Slumber" cannot be activated. : Can "Super Anti-Kaiju War Machine Mecha-Dogoran" be Special Summoned by the effect of "Interrupted Kaiju Slumber"? 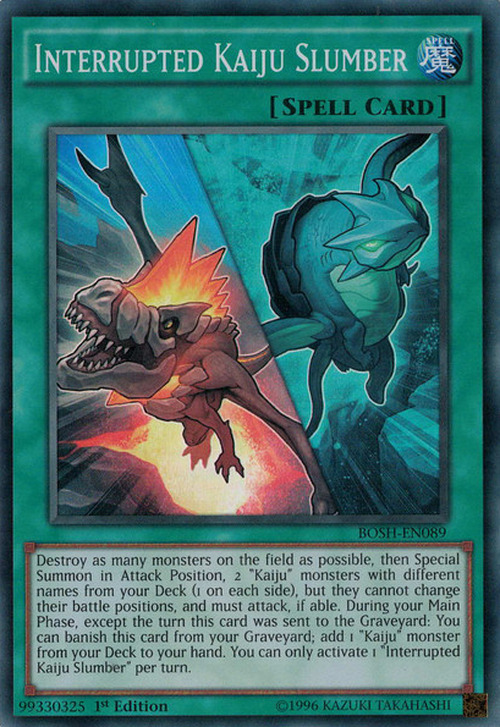 While "Blue-Eyes Spirit Dragon" is in the Monster Zone and its effect "Neither player can Special Summon 2 or more monsters at the same time." is being applied, "Interrupted Kaiju Slumber" cannot be activated. : Can "Interrupted Kaiju Slumber" be activated while "Blue-Eyes Spirit Dragon" is in the Monster Zone? While the effect of "Vanity's Emptiness" is being applied, since monsters cannot be Special Summoned, "Interrupted Kaiju Slumber" cannot be activated. Note that if "Vanity's Emptiness" is activated in a Chain to "Interrupted Kaiju Slumber", the resolution of "Destroy as many monsters on the field as possible" is applied, but the resolution of "then Special Summon in Attack Position, 2 "Kaiju" monsters with different names from your Deck (1 on each side), but they cannot change their battle positions, and must attack, if able." is not applied. : Can "Interrupted Kaiju Slumber" be activated while "Vanity's Emptiness" is active? "Interrupted Kaiju Slumber" can be activated even if a "Kaiju" monster is in the Monster Zone. In that case, all monsters on the field are destroyed and the resolution of "then Special Summon in Attack Position, 2 "Kaiju" monsters with different names from your Deck (1 on each side), but they cannot change their battle positions, and must attack, if able." is applied normally. : Can "Interrupted Kaiju Slumber" be activated if a "Kaiju" monster is in the Monster Zone?